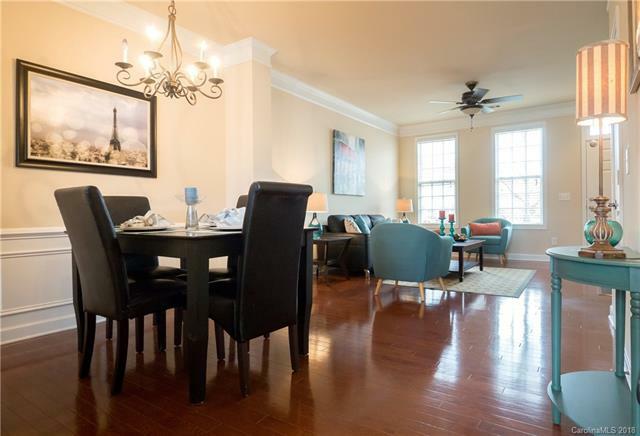 Perfection plus in this Charleston Style Townhome in Antiquity professionally staged and with brand new paint and carpet, hardwood floors on the main level. Two bedrooms each with a full bath and walk in closet. Pull down attic and a huge storage closet under the stairs. Powder room on the main level right off the kitchen for convenience. Private fenced in patio has custom brick hardscape. Washer, Dryer, and refrigerator convey. Antiquity is a charming neighborhood with community events, pocket parks, walking/hiking trails, a dog park and pool. Cable and internet paid for by HOA! Easy access to grocery stores and restaurants and downtown Cornelius. Seller is offering a one year home warranty with 2-10 Homebuyers Warranty. Now Priced to sell quickly. This is truly an "A" List home. Better Hurry!